The first steel part has been cut for NCL’s upcoming cruise ship the Norwegian Escape at the Mayer Werft shipyard in Papenburg, Germany. The steel cutting was watched by cruise line and shipyard executives which is tradition. The plasma torch cut the steel to the delight of everyone who has worked hard to make the ship happen. The piece of steel-cut is for Block 46 which will eventually become part of the Norwegian Escape. Norwegian Escape is the first of two new Breakaway Plus class ships which will be the largest ever built for the cruise line at a massive 163,000 tons which is slightly smaller than the new Prototype ships MSC Cruises will be building with rival shipyard STX France. Norwegian Escape has recently had is hull artwork revealed at the Cruise Shipping Miami convention just a week ago. the new artwork is by Guy Harvey which Cruise Hive recently reported on. Also announced at the event by Norwegian Cruise Line is that Norwegian Escape will be joining Norwegian Getaway cruising all year round from PortMiami in Florida. 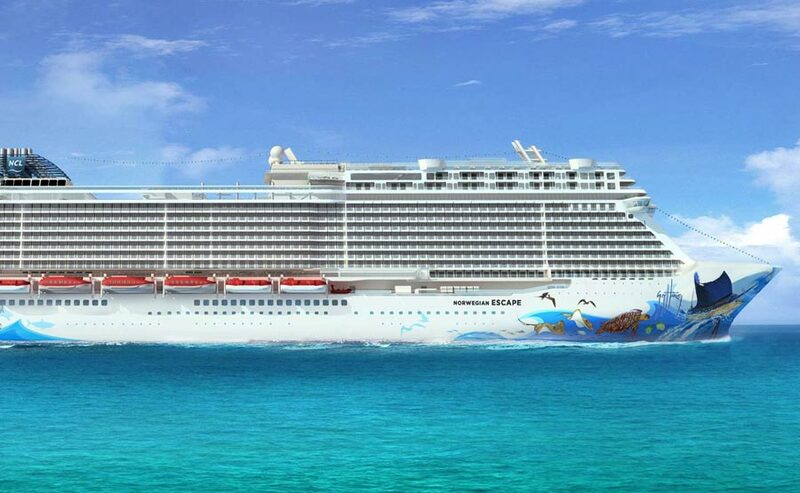 Norwegian Escape will be completed by the end of 2015, a sister ship Norwegian Bliss will also be built by Mayer Werft.